For every show, the data includes the order in which the acts performed, and indicates which were among those receiving the fewest public votes. (This analysis only considers the information about the public vote – not the judges’ decisions on whom to save or send home.) I gave 1 point to those acts that were definitely staying, and 0 points to those in the bottom two or three (depending on the show and series) who were in danger of being sent home. These scores were then compared to the proportion of acts expected to definitely go through from each show (or to win, if it was the final). So if there were ten acts and the three with the fewest votes were in danger of being sent home, the chance of definitely going through was 7/10 or 70%. The chart below shows the actual chance of definitely going through (on the vertical axis), according to the proportion of acts expected to do so (on the horizontal axis), for those acts performing last (in red) and all other acts (in blue). If performing position made no difference, these values would be equal (shown by the dotted line). In the early stages of the competition, when more than two-thirds of the acts will not be in danger of being sent home, the last performer has at least a 90% chance of keeping out of danger. By the final, when there are just three acts left, the last performer actually has almost a 60% chance of winning. The chances of the other acts are correspondingly lower than average – by the final each of the other two acts only has about a one-in-five chance of taking the title. This pattern applies for all series of the UK X-Factor (with some statistical variation in the exact numbers from year to year). It also seems to be the case that acts are more likely to be in danger as a result of the public vote, the earlier they perform in the show. Those performing first are most likely to be among those at risk. The obvious explanation is that the last act is the one most likely to be in people’s minds at the point, once all the acts have performed, that they reach for the telephone and cast their vote. (It would be interesting to analyse whether the last-performer advantage is reduced by opening the voting lines before all acts have performed, which some shows have tried). What we can’t rule out, of course, is that the more promising acts are deliberately put towards the end of the running order. 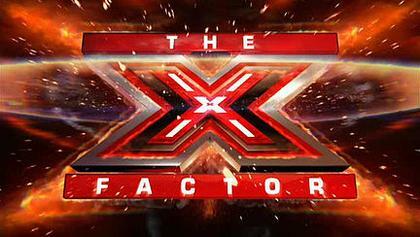 However, there is no evidence from the X Factor data that the same acts are consistently programmed late in the show as the series progresses. Whatever the reason, the acts performing last in these talent shows seem to have a real and surprisingly large advantage. It is perhaps surprising that the voting arrangements have not been changed in order to reduce this effect – but perhaps good TV is more important than fairness in these things. Cite this article as: Gustar, A.J. 'Why it pays to perform last' in Statistics in Historical Musicology, 9th February 2019, https://www.musichistorystats.com/why-is-pays-to-perform-last/. 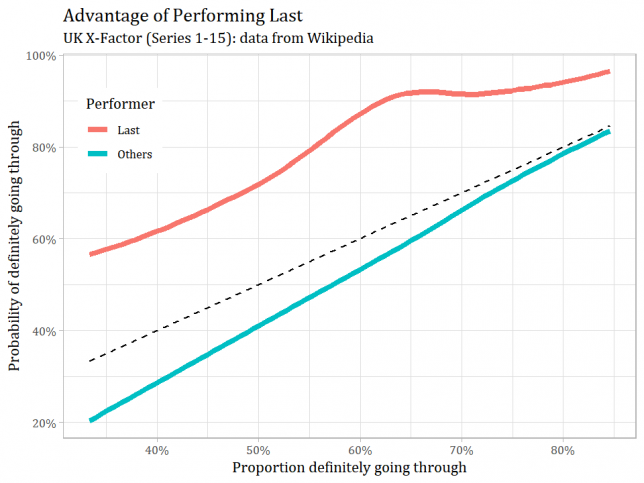 Using the same technique to analyse the Wikipedia data on the twelve series of ‘Britain’s Got Talent’ reveals that, of the 70 winners of all of the shows (semi-finals and finals, each with around eight acts), 36 of them (over half) were the last-performing act in their show. Indeed, for those years where the full public voting information is available, it does appear that the running order in the final has very often (but not always) been the order of the share of public votes from the semi-final, with the most popular act going last.